Earlier when Sun Microsystems was in charge of Java, the popular Java certifications were called "Sun Certified Java Programmer" or "SCJP" and that time there was just one exam, you need to pass to become a certified Java Developer, but when Oracle took over Sun Microsystems on 2010, the SCJP goes away and OCAJP and OCPJP born. Since Oracle already has his certifications for database administrations e.g. OCA which stands for Oracle certified associates and OCP, which stands for Oracle Certified Professional, it introduces new Java certifications to match their existing hierarchy and they are known as OCAJP and OCPJP in the Java world. The OCAJP is an associate level exam and demonstrate that you have basic understanding of Java programming language and its features, but OCPJP is a professional level exam and shows that the developer is not only familiar with Java basics but also has good understanding of Java API and various other key Java concepts required to build Java application in real world e.g. JDBC, NIO, Java 8 features and new Date and Time API. In short, OCAJP is basic level Java exam while OCPJP is a higher level exam, but the key thing to remember is that they are two separate exams and you need to pass both of them to become a certified Java developer. There are two versions of OCAJP and OCPJP exams exist at the moment e.g. OCAJP7 (1Z0- 803) and OCPJP7 (1Z0-804) to become a certified Java SE 7 programmer and OCAJP 8 (1Z0-808) and OCPJP 8 (1Z0-809) to become a Java SE 8 certified developer. The most important thing to remember is that you cannot become a certified developer if you just pass OCAJP7 or OCAJP8 exam, you must pass them in pair e.g. OCAJP 7 + OCPJP7 or OCAJP8 + OCAPJP8. Even if you pass 1Z0-803(OCAJP7) exam you are not allowed to take the 1Z0-809 exam (OCPJP8) because you haven't passed the 1Z0-808. As I said even though OCAJP and OCPJP are core Java exams they are two different exams, hence they have different exam codes, syllabus, eligibility criterion and difficulty level. We'll compare them shortly but that's what you need to keep in mind. Both have different exam code, generally, OCAJP has lower exam code then corresponding OCPJP exam e.g. for Java SE 7, the OCAJP 7 has exam code 1Z0-803 while OCPJP7 has exam code 1Z0-804. Similarly, for Java SE 8 certification, the OCAJP8 has code 1Z0-808 while OCPJP 8 has code 1Z0-809. As I told, both are different exams. The OCAJP is generally known as Programmer I certification and OCPJP is generally known as OCPJP 8 certification. For example, OCAJP 7 is known as "Java SE 7 Programmer I" and OCPJP7 is known as "Java SE 7 Programmer II", Similarly OCAJP 8 is known as "Java SE 8 Programmer I" and OCPJP 8 is known as "Java SE 8 Programmer II"
There is no pre-requisite for OCAJP exam. Anyone can give this, even if you are not a computer science graduate, a college dropout, a code camp student, a free-launcher or a self-taught programmer, you can give OCAJP exam. But for OCPJP exam, you must first pass the OCAJP exam. And most importantly, you can only become a certified Java developer if you clear both OCAJP and OCPJP exam. Surprisingly, cost of most of the Java certifications is same. For example, cost of OCAJP7, OPJP7, OCAPJ8, and OCPJP8 are all 245 USD in America and 10,100 INR in India. The cost varies depending upon your country for example in the UK it's around 155 GPB, in Canada and Australia it's around 336 CND and 336 AUD and in Switzerland, it's around 248 CHF. Usually, the duration for OCAJP and OCPJP exam is 2.5 hour or 150 minutes but OCAJP7 or 1Z0-803 exam is a 2-hour exam. The different exam has a different number of questions e.g. 1Z0-803 has 80 questions to be solved in 120 minutes while 1Z0-804 has 65 questions to be solved in 150 minutes. Similarly, OCAJP 8 has 80 questions to be solved in 2.5 hours and OCPJP8 has 85 questions to be completed in 150 minutes. Usually, the passing percentage is around 65% but OCAJP 7 has a passing percentage as 63%. Syllabus and exam topics are different for different exams. you can view the exact topics for each exam in relevant sections for OCAJP7, OCPJP7, OCAJP8, and OCPJP8. 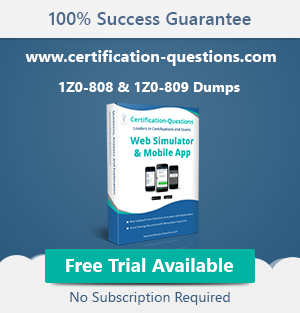 In general, the OCA exams include less topic and OCP include more topics and 1Z0-804 and 1Z0-809 is no exception. I suggest joining the Java Fundamentals: The Java Language, a free course from Pluralsight for OCAJP exam, it gives you a nice overview of essential features of Java programming langauge. Validated Against: Java SE 7. This exam has been written for the Java SE 8 release. This exam is validated against Java SE 8. Though, if you already hold a Java certification then there are other exams to become a certified Java 8 developer. You can always upgrade yourself by taking either 1Z0-810 or 1Z0-0813 exam. See this article to learn more about which Java certification exam you should take. 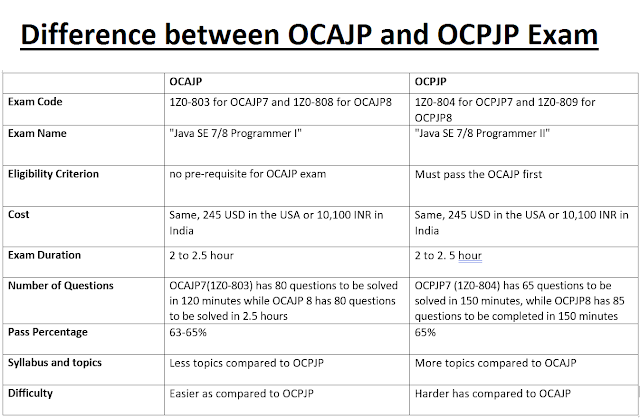 That's all about the difference between OCAJP and OCPJP exam. The differences hold true for both OCAJP 7 vs OCPJP 7 as well as OCAJP 8 vs OCPJP 8. The topics, cost or other exam details may vary depending upon a time but expertise level and eligibility criterion will remain constant until Oracle decides to do away with it. The OCAJP is an associate level exam and easier than OCPJP which is a professional level exam. Though you must pass both OCAJP and OCPJP to become a certified Java developer e.g. to become a Java SE 8 certified programmer, you must pass OCAJP8 (1Z0-808) and OCPJP8(1Z0-809) exams. Does Java certification help in Job and Career? Which Java 8 Certification Should you Take? 1Z0-808 or 1Z0-810? What is a good time to become Java Certified Programmer? Do you need to pass OCAJP before taking OCPJP? Thanks for reading this article so far. If you like this tutorial then please share with your friends and colleagues. If you have any questions or feedback then please drop a comment. Alhamdulillah Today I cleared OCAJP8 certification with 94%. So thanks a lot Javin for your great help and contribution. I started preparation with your guidance only, followed Mala Gupta as a guide and Whizlabs for Test series as well I always follow your blogs in all your Facebook, LinkedIn all over blog sites. In future If possible I would like to work with you and It would be my pleasure. It's all your hard work, get your OCPJP8 this year and you will be Java 8 certified. All the best for your future and thanks a lot for sharing your story with us.